Your wedding is coming and how many times a day are you checking that weather map for rain? Oh no, it looks like rain… on your wedding day. Did you know that rain is the number one fear of brides-to-be when planning a wedding. Is rain really that terrible? 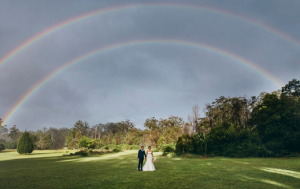 It certainly can be tricky to say the least if you have an entirely outdoor wedding planned, however there are arrangements that you and your venue can agree on in advance just in case! We’ve had couples get married in blizzards, under threats of hurricane, through ferocious winds, torrential downpours, hail, and lightening. It happens, it’s weather, and there is no sense stressing over something over which you have zero control. You plan for it ahead of time, instead. 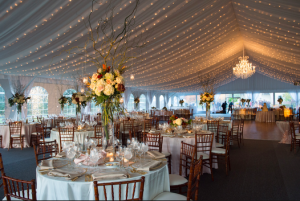 If your venue has indoor space, make sure it is large enough to accommodate all of your guests. Find out the details on room set up, views, aisle, and that there is room for the photographer(s) and videographer. If you have decor such as an arbor, columns, flowers, lanterns, and the like, can they be incorporated into an indoor ceremony? Who will set up? If you know these details in advance it will take off the pressure. If there is no indoor space, discuss options for inclement weather such as tenting (does it have sides to block out wind and rain? ), portable heaters, a walkway that won’t involve guests walking through wet grass? Chances are good your venue has been through this before and has a great Plan B option for you. Ask your photographer/videographer about his/her experience shooting in inclement weather. What is some of their advice on how to get the best photos? 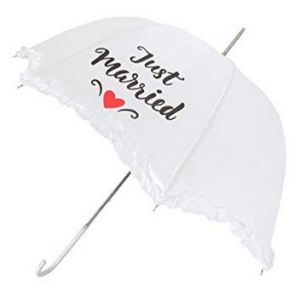 Have you seen some of the adorable bride/groom shots under pretty umbrellas and holding hands and cuddling in the rain? The softer lighting and mist can create incredibly emotional backdrops that photographers are unable to replicate in the sunshine. And, what if you get that rainbow?! And when it comes to those umbrellas, make sure there are plenty of extras for your guests. Not just your heads with an umbrella! Consider a wrap or pretty jacket to match your dress to keep you dry and warm, and don’t forget shoes! 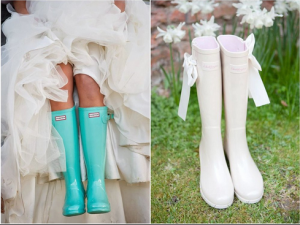 Pretty rain boots might be just the right accessory for you and your wedding party, or consider other options like cute sneakers with no-slip soles. Put some thought into it regarding matching your colors, perhaps customizing the umbrellas with their names. If you are upset, acknowledge that and then let it go. Breathe and be present. This is the day you are marrying your best friend – for better or worse, through sunshine or rain – and when your day is over you will start your new married life after having had the time of your life. Now go, plan ahead, and get married!